Dr Mckim from Mercy Animal Clinic in Gardendale is a wonderful Veterinarian to our Goldendoodles. Everyone at Mercy are friendly and so compassionate! 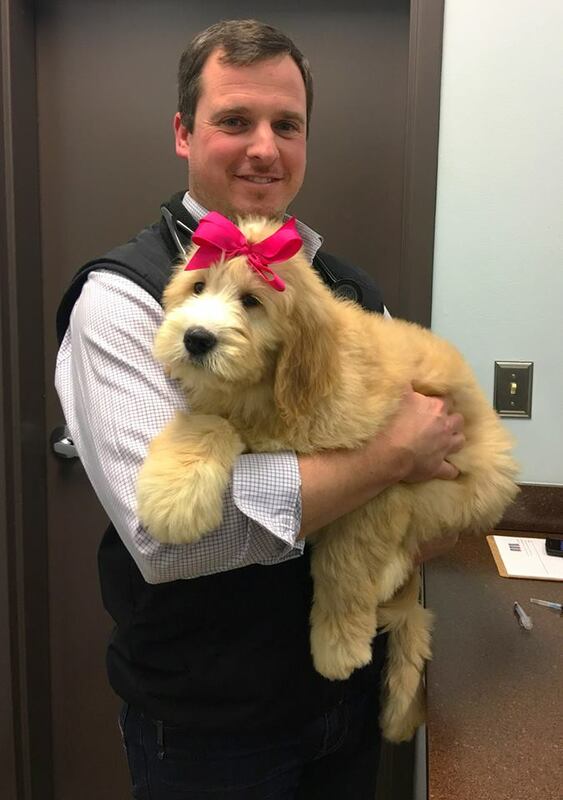 Dr. Mckim is pictured above with one of our Goldendoodle babies named Honey! Dr Thomas Creel has been our vet for many years also .He is from Sumiton Animal Clinic. We use Sumiton Animal Clinic as well as Mercy. He recently stated to us that we had quite an impressive record for no gentetic diseases in our line! Every puppy will recieve a complete exam with shots and deworming. They go to see Dr. Creel or Dr Mckim at six weeks of age. Your puppy is guaranteed against hip displasia for a period of 2 years. Your puppy is guaranteed against Parvo for a period of 7 days from the date pup leaves Jefferson Goldendoodles. The 72 hour rule applies here. You must show documentation by your vet. We do not guarantee against coccidia which can happen due to change of environment though every precuation will be taken to guard against it. Your puppy is guaranteed against major congenital defects that are life-threatening or greatly affect affect the quality of life of pup for 2 years from the date of purchase. In the event a congenital defect is found that is life -threatening or greatly diminishes the quality of life for the puppy, the puppy will be replaced apon the next available litter or a full refund of the purchase price of the puppy will be given not to exceed the price of the puppy. If you would like a full refund for the price of the puppy in the event of a congentital life altering disease refund will be made within 12 months of submitted documentation by your vet. You must show documentation of your vet's findings and a diagnosis. All deposits are non-refundable.You can roll over to another litter. You must show proof of vet visit within 72 hours of adopting your pup to ensure that pup received proper vaccinations and exams for any of the health Guarantees to be honored as stated above.. Diseases such as Parvo and Distemper must be vaccinated against within the first two week window for those diseases to be covered during that first 7 day period. Any case must be documented by your vet and submitted to Jeffersondoodle or faxed to my vet. 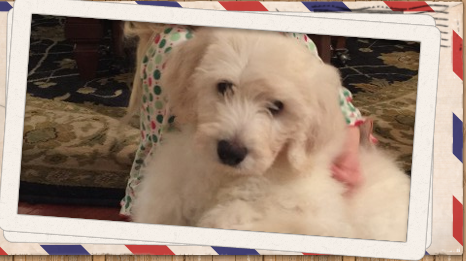 Thanks for choosing Jefferson Goldendoodles! All results are up from our health Testing and All parents tested clear of any major diseases. Check out the testing on our parents page!